Penelope focuses on the establishment and structuring of private investment funds, with a particular emphasis on hedge funds and private equity funds. She also has in-depth experience advising on classified funds, as well as QFII and RQFII funds. Indeed her extensive years in providing legal leadership advice to such clients also extends naturally to advising on legal issues concerning marketing, on-going regulatory, compliance, side letters, derivatives documentation, ISDA and prime brokerage agreements. 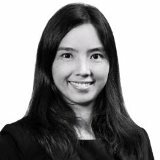 Her clients include some of the largest asset managers in Hong Kong, China and Singapore on funds formation and restructuring, and compliance and Hong Kong regulatory requirements, covering marketing and distribution of funds, management, as well as suitability requirements. Suffice to say, Penelope’s substantial experience from working at top-tier law firms, both onshore and offshore, has equipped her with first class knowledge in her chosen field, while exposing her to its biggest players in the region. The asset management market in Asia is constantly evolving based on economic and political pulsations. But with a nuanced and experienced finger on this pulse, and close working relations with industry service providers including administrators, custodians, trustees and prime brokers, Penelope is well placed to provide clients with not just direct expertise, but also keen market intelligence.